Protein A will not bind goat IgG, so use alternates (eg. protein G) in IP with this antibody. This antibody is Goat anti-GFP serum (ab5449) affinity purified using a HiTrap-NHS activated sepharose column (Amersham-Pharmacia) containing covalently linked highly purified recombinant GFP. After applying the serum to the column and extensive washing, the eluted anti-GFP immunoglobulins are desalted. Our Abpromise guarantee covers the use of ab5450 in the following tested applications. Immunohistochemical staining of donor BMDCs expressing GFP in mouse pancreas tissue using ab5450. Antigen retrieval was carried out using target-retrieval solution for 30 minutes in a boiling water bath. Endogenous peroxidase activity was quenched with 3% hydrogen peroxide (5 minutes). Panels A and B were detected with a polymer horseradish peroxidase anti-rabbit detection system (30 minutes) and 3,3′-diaminobenzidine was used as a substrate. 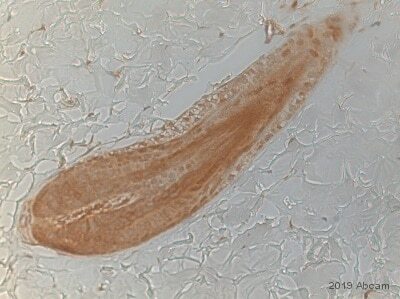 Counter-staining was performed with hematoxylin. ab5450 staining GFP in GFP-transfected NIH3T3 cells. The cells were fixed with 4% formaldehyde (10min) and then blocked in 1% BSA / 0.3M glycine in 0.1%PBS-Tween for 1h. The cells were then incubated with ab5450 at 1/2000 dilution overnight at +4°C followed by incubation with ab150129, Donkey Anti-Goat IgG H&L (Alexa Fluor® 488), for 1 hour, at 1μg/ml. Under identical experimental conditions, when compared to the basal level of GFP expression in transfected NIH3T3 cells, the cells upon which ab5450 was applied gave a stronger signal in the 488 channel, indicating that ab5450 is binding to GFP and therefore eliciting signal amplification. ab5450 was also applied to non-GFP-transfected NIH3T3 cells, which produced no positive staining, indicating specificity for GFP. Nuclear DNA was labelled with 1.43μM DAPI (blue). 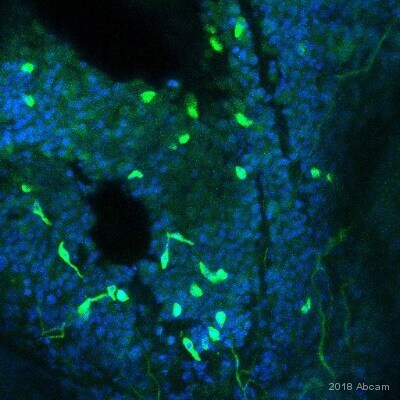 Immunohistochemistry (Formalin/PFA-fixed paraffin-embedded sections) - Anti-GFP antibody (ab5450)Image courtesy of an anonymous Abreview. ab5450 staining GFP in murine brain tissue by Immunohistochemistry (Formalin/PFA-fixed paraffin-embedded sections). Tissue was fixed with paraformaldehyde, permeabilized using 0.2% Triton and then blocked with serum for 1 hour at room temperature, followed by incubation with the primary antibody at a 1/1000 dilution for 14 hours at 4°C. A Cy2®-conjugated secondary antibody was used at a 1/200 dilution. 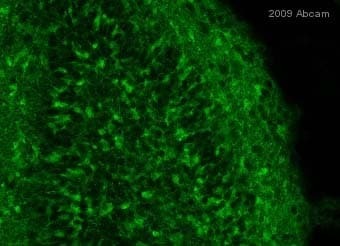 IHC - Wholemount - Anti-GFP antibody (ab5450)Image courtesy of Sana Zakaria by Abreview. 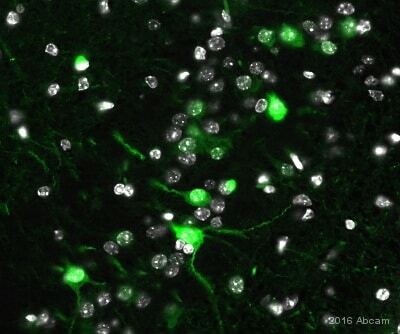 ab5450 staining GFP in murine hindbrain tissue by IHC-Wholemount. Dissected hindbrains of E12.5 stage embryos were fixed in 4% paraformaldehyde for 4-5 hours and then washed in PBS before proceeding with immunolabelling in PBS with 1% triton. Primary antibody was incubated for 4-6 days (99-144 hours). The hindbrain was cultured as an explant after GFP was electroporated. 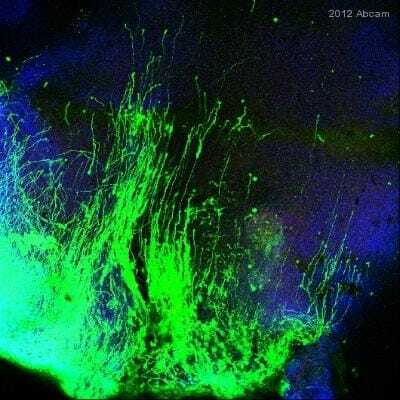 The wholemount immuno with ab5450 at a 1/500 dilution was done to see if GFP could be detected, it was the same GFP expression with the antibody as that which had been seen initially with the electroporation. The secondary used was an Alexa-Fluor 647 conjugated donkey anti-goat polyclonal used at a 1/150 dilution. Blue is DAPI and green is the GFP antibody (pseudo-colored from red Alexa Fluor 647). 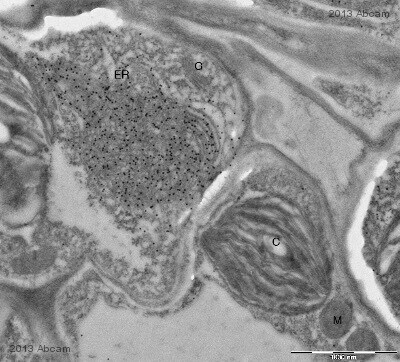 Electron Microscopy of Arabidopsis thaliana tissue sections labelling GFP with ab5450. An 18nm gold-conjugated Donkey anti-goat IgG polyclonal (1/15) was used as the secondary antibody. Arabidopsis thaliana transgenic plant expressing GFP fused to an Endoplasmic Recticulum (ER) marker. No label is observed in: C - chloroplasts, M - mitochondria, G - golgi. The sample was prepared by cryofixation and embedding in Lowicryl HM20 resin. The image was taken in a JEOL 1010 transmission electron microscope at 20,000× magnification. I'd like to do IP and Western blot using these antibodies. My proteins are mTurquoise or mCitrine tagged. Do the above antibodies recognize mTurquoise or mCitrine? Since mTurquoise or mCitrine originate from Aquorea victoria jelly fish, then they will react with these GFP antibodies. Will this antibody react with mCherry or dsRed? En relación a la dilución recomendada para usar el anticuerpo en Microscopia Electrónica, lógicamente dependerá del nivel de expresión de la proteína en las muestras, pero en general, aconsejamos usar tres diluciones para empezar: 1/250 (1ug/250 ul), 1/1000 (1ug/1000ul) y 1/2500 (1ug/2.5ml). Si tienes cualquier otra consulta no dudes en volverme a contactar. im Anhang finden sie zwei IHC-Figures und den ausgefüllten Fragebogen. Vielen Dank für das Zusenden der detaillierten Daten. Ich entschuldige mich für die lange Zeit, welche Sie auf eine Antwort warten mussten. Das Labor hat leider nicht getested ob der ab5450 die Pre-Form erkennt, denkt jedoch, dass dies absolut möglich ist, auch aufgrund des hohen Titers dieses Antikörpers. 1.) Haben Sie eine Isotypen Kontrolle gemacht, um allfällig unspezifische Färbung auszuschliessen? 2.) Haben Sie eine Kontrolle in nicht-transgenem Gewebe gemacht? Dies würde erlauben, wieder Hintergrund und auch endogene CXCR4 Expression auszuschliessen. 3.) Der UMB2 Antikörper erkennt ja nur ein Epitop auf dem CXCR4 Protein (im C Terminus). Vielleicht erkennt dieser Antikörper dann nur das Protein, wenn das Epitop freistehen ist- vielleicht, absolut hypothetisch, könnte dies anders sein einer neuenIsoform, modifizierter Form oder in einemProtein Complex, welche dannnicht in allen Zellen exprimiert wird. Vielleicht könnten Sie parallel zu dem UMB2 auch einen polyklonalen Antikörper gegen das ganze Protein von CXCR4 ausprobieren? Ich kenne leider keinen Antikörper gegen GFP/EGFP, welcher getestet wurde, dass er nur dasreife Protein erkennt. Bitte lassen Sie mich wissen, was Sie von den oben genannten Vorschlägen halten. Falls Sie einen anderen CXCR4 Antikörper testen wollen, können wir Ihnen vielleicht auch ein Testangebot machen. Customer kindly called to ask for any information which we may have regarding use of these products in EM.